Merritt College’s 2015-2020 Educational Master Plan emerged in Fall 2015 and continued through Spring 2016 with extensive reflections, ideas, and campus-wide participation by the Merritt College community. The Educational Master Plan serves as a key part of the college’s integrated planning process and will be implemented during the next five years through action-oriented strategic plans. 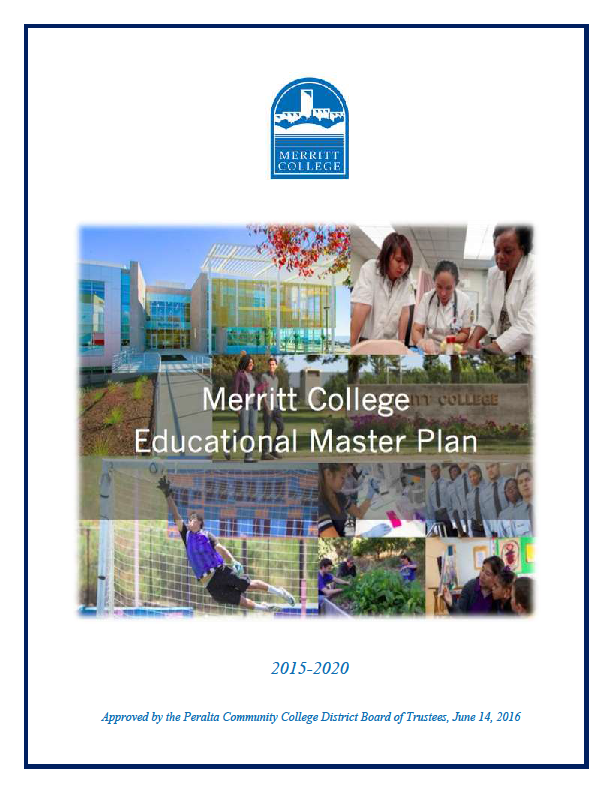 Merritt College’s Educational Master Plan is the foundation and the primary reference for guiding program planning and reviews, managing student learning outcomes, and coordinating college resources. The plan embraces new ideas to augment and further strengthen our programs and services for student success. It exemplifies opportunities for greater attention to partnerships, college engagement and innovation for students. Lastly, it affirms that Merritt College will continue to serve its students and community effectively with broad-based leadership, and vision for the next five years. Thanks to the entire college community for their involvement in this important endeavor. And, a special thanks to the Educational Master Plan Committee for their extraordinary commitment and for the many hours they spent in developing and shaping this plan. Merritt College Education Master Plan centers on the preparation of our students as future leaders of the 21st century! Merritt College- We change lives!